Bigger Houseboat, how to convince my husband? How to get a Bigger Houseboat? How to convince my husband to buy a bigger houseboat! Here's my situation, we're already living on a housboat for a few years and it's a great lifestyle. This in reality becomes our floating house, however lately I want to upgrade to a BIGGER houseboat and possibly buy a new houseboat with at the new amenities and options. My husband always ask me why? I tell him that as a woman I just need more space, and I'm sure many woman here will understand me. I need my own space, and my own corner, not only the "kitchen". I know a bigger houseboat is more money, more in dock fees, more money for fuel, but what the hell we only have one life to live, and heck, it's our floating house. My husband always says you should be lucky you have a houseboat, doesn't matter what you have, at least we have a houseboat. I truly love my husband, but this is a big issue with us right now. Can you help me with ideas on how to convince my husband to buy a bigger houseboat? You have to fire up the "Boys and their Toys" side of the male brain. If you manage to persuade your husband to get a bigger boat, you now have to decide wether you want a new boat with all the new "bells and whistles" OR if your budget is more inclined towards a used houseboat. 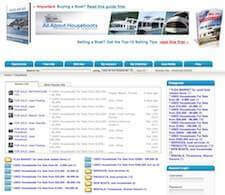 If you are looking for NEW boat, we can help you with a new houseboat quote. 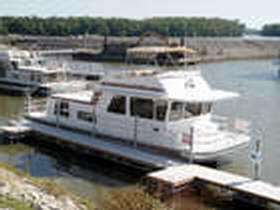 If you are looking for a USED boat, we can help you to find a used houseboat. Lastly, hopefully some of our readers and visitors will share and post comments about how you can get your husband to decide to buy a bigger houseboat. 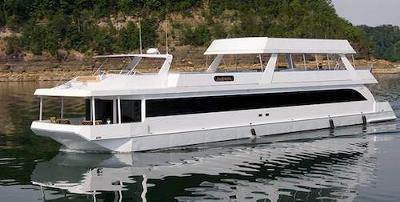 Comments for Bigger Houseboat, how to convince my husband? Okay, I agree with Ian to a point. There is another side you can look at. 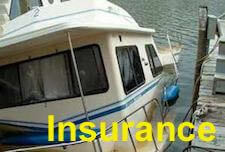 It's savings, investment and return on your boat. First, explain how so many people are going into foreclosure on their homes that they are ready to practically give away their toys. Some of these toys are boats of all sizes, styles and makes. Hey, it's true. I don't know what size houseboat you want but I can bet that you can find what you want at a tremendous savings. All it takes is a little searching. You have to ask if you want something. 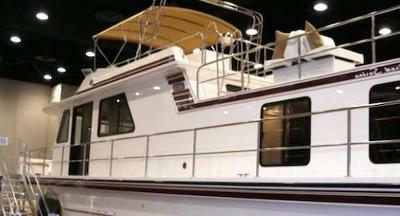 If you see a houseboat that is advertised at (just for grins, let's say) $55,000. Okay you like it. Call the owner and make them a very low offer. This is not just on lower priced boats but anything on the market. 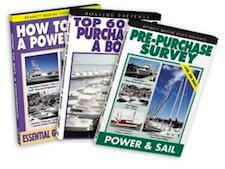 Look for boats that have been for sale for several months or even a year or more. These people are willing to negotiate like you won't believe. Now, you keep the house boat for a few years, like you planned on doing anyhow, and watch the market go back up. When it turns around for housing the toy market will also turn up. Thus, your $30,000 investment may reap you the full value later. IE; I just bought a very well equiped, great condition, fully running houseyacht for LESS than 20% of it's book value. It is huge and the wife is happy beyond belief. In the meantime, we stand to sell at a very handsome profit whenever we do decide to sell. There are not that many places you can live on a boat and even less so on a houseboat in Canada. Without given away any secrets, are you in British Columbia? Northern Ontario Houseboaters and Friends are located on Lake Nipissing, Ontario Canada since 2001. We hand built our new family houseboat in 2005. The way to convince your husband is to show the passion for the recreational sport. Involve family and friends to help build your dream houseboat. It took us one year an a half on the back lawn to built our houseboat 10 wide x 45 long. It takes a lot of pre-planning, tractor muscles, time and skills...so you will need to start a binder for your plans and building supplies. Get ready to do a lot of cooking too for your helpers. Tell your husband you get a lot more for your money and many months of use from the houseboat compared to other recreational toys- it's worth it! You will have more storage, living quarter space, a propane/electric apartment size fridge, gas oven, better cupboards and pantry...just plain more comfort on long trips for you and the kids. You want to enjoy it with family. He can have storage for his tools, fishing rods, life jackets, propane tanks, outdoor ice box for beverages...Maybe an onboard office?